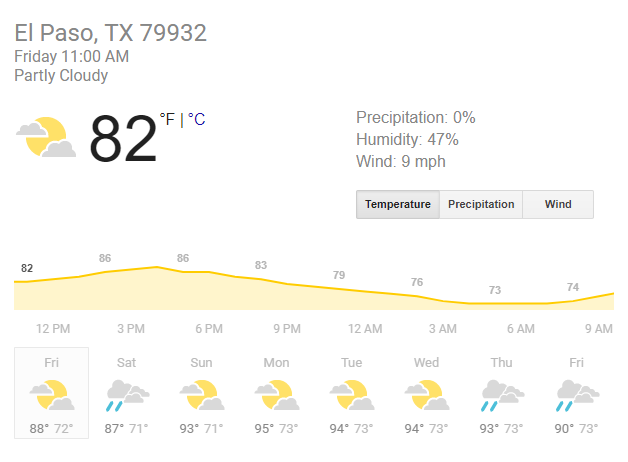 It’s going to be a hot and humid week for El Paso. Did you know that high humidity can put us at a greater risk for heat stroke? In the most extreme cases, the body is unable to sweat and its normal temperature of 98.6 rises to 106 or higher within 10 or 15 minutes, according to the Centers for Disease Control, and death or permanent organ damage can result. When the humidity is high, your sweat can’t evaporate as easily and your body has more difficulty cooling itself, making you prone to heat exhaustion and heatstroke. When the heat index is 91 F (33 C) or higher, you should take precautions to keep cool. Cover up your skin from the sun as much as possible with clothing, hats, sun umbrellas, and always wear sunscreen. When the heat index and humidity are high, know your body is not as effective as cooling itself through sweating.